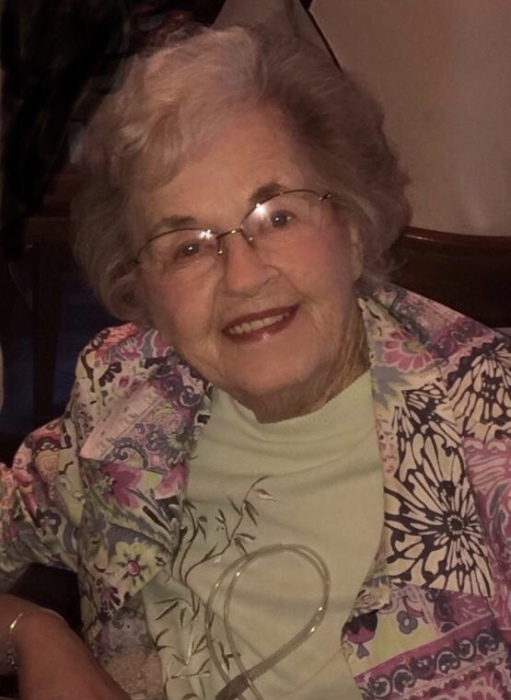 Florence Louise Smith Carr, 94, formerly of Williston, SC, went to be with the Lord on her 71st wedding anniversary, March 28, 2019, widow of William Hoge “Bill” Carr, Jr. She was a daughter of the late Lynn Warren and Mattie Sue Elmore Smith and was preceded in death by sisters, Dot Welfley, Mabel Bibb, Annette Widmer, Elaine Winfrey, and Margaret Sherrod; brothers, Tommy and Harry Smith; daughter-in-law Wanda Dodge Carr. Florence is survived by her sons, Robert Alan “Bob” (Lisa) Carr and William Warren “Bill” (Loren) Carr; step-daughters, Melissa Sullivan and Anne Carr; daughters-in-law Beth Thomas and Kim Carr; grandson-in-law Jake Ryan, Jr.; grandchildren, Kevin Clark (Mimi) Eller, Robert William “Robbie” Carr, Erin Murdaugh (Allen Crosby) Ryan, Cindy Carr (Scotty) Richardson, Austin James (Brooke Zeigler) Carr, Sophia Gayle Carr, Olivia Loren Carr; great-grandchildren Makayla Carr, Haley Lynn Altman, Madeline Paiger Eller, Katherine Louise Ryan, Brian Earl Bodiford, Jr., and Carter James Carr; many attentive nieces and nephews. Florence was born October 7, 1924 in Brunswick County, Virginia. She was valedictorian of her class at Danieltown High School where she played on the basketball team and was a member of the 4 – H Club. She finished Longwood College in Farmville, Virginia. For many years, Florence worked as a secretary in Oak Ridge, Tennessee, where she met the love of her life, Bill. She was a volunteer for the YWCA, Office on Aging – Meals on Wheels, and the County Alcohol and Drug Abuse Commission. Florence enjoyed being a member of the Ivy Garden Club and numerous bridge clubs. Williston United Methodist Church has been her church home since the early 1970’s; there she served as president of the United Methodist Women for 10 years, was Woman of the Year in 1993 and 2014, served as secretary of Administrative Council for many years, and was the membership record keeper. Florence’s family will be forever grateful for her wonderful, God sent, caregivers, Miss Beulah, Miss Tonya, Miss Ann, Mr. & Mrs. Jake Ryan, Sr., Mr. Marvin Murdaugh and Hospice Care of South Carolina. Funeral services will be held at 3:00 P.M., Sunday, March 31, 2019 in the chapel of Folk Funeral Home at 170 Elko Street, Williston, SC, with the Reverend Keith Stewart officiating. The family will receive friends one hour prior to the service and other times at the home on Donna St, Williston, SC. Interment will follow in the Williston Cemetery. Memorial contributions may be sent to the Williston Cemetery Fund, P.O. Box 367, Williston, SC 29853 or Barnwell Circle Theatre, P.O. Box 92, Barnwell, SC 29812.